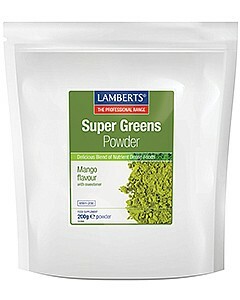 This all-natural super greens powder contains an exclusive blend of nutrient dense foods. An exclusive blend of nutrient dense foods This all-natural super greens powder contains an exclusive blend of nutrient dense foods, specially chosen for their important properties. This is a premium formula that emphasises the latest nutrients such as kale, spinach and broccoli, alongside old favourites like spirulina, alfalfa, chlorella, artichoke, barley grass and wheatgrass. Pleasant tasting drink Each 5g serving provides less than 14 calories. Natural Flavouring with Sweetener: Stevia, Kale Powder, Spinach Powder, Broccoli Powder, Spirulina Powder, Barley Grass Powder, Wheatgrass Powder (Gluten), Alfalfa Powder, Chlorella (Broken Cell Wall), Artichoke Powder. Children over four years – Add 5g (1 teaspoon) daily with 125ml of cold water, juice or a smoothie, or as directed by a practitioner or pharmacist. Adults – Take as directed for children above, or increase to 10g (2 teaspoons) with 250ml of cold water, juice or a smoothie, or as directed by a practitioner or pharmacist. The following list of allergens are excluded: Wheat, Barley, Soya, Eggs, Milk (and milk products), Lactose, Nuts, Sulphites, Celery, Fish, Shellfish, Yeast containing ingredients. This product is suitable for vegetarians & Vegans.